This Dairy-Free Cream of Tomato Soup literally takes all of five minutes from start to finish. It’s vegan and paleo, and gets made in a blender! I’ve been dairy-free for about 8 years now, and cream of tomato soup is one of those recipes I miss. I’m happy to report that I feel like this recipe satisfies that craving, along with being super nourishing and health-promoting. I left out the cream, and used macadamia nuts or avocado instead! Both substitutions are healthy, and add creaminess to a 100% dairy-free recipe. Note: I shared this recipe back in 2015, but I’ve updated it with a how-to video at the end of this post. So I mentioned that this dairy-free cream of tomato soup recipe gets made in a blender. If you have a high-speed blender, you can actually heat the soup to simmering right in your blender. If you have a regular blender, you can blend the ingredients and then transfer the soup to the stovetop to heat it for serving. Either way, this recipe can be made in 5-10 minutes, tops. I love it for an easy lunch, especially served with some pasta salad or gluten-free toast on the side. You might even have all of the ingredients in your pantry, including boxed or jarred tomatoes, dried herbs, and nuts or avocado. Feel free to use dried basil if you don’t have any fresh leaves. This recipe is definitely reminiscent of the canned tomato soups I ate when I was younger, but so much healthier with clean, real ingredients. I’ve been playing around with nutrition data too, and included a label for this recipe. A scoop of collagen protein (not vegan) would help make it a meal with more staying power. Gather your ingredients: crushed tomatoes, nuts OR avocado, herbs, and water. Combine the ingredients in the pitcher of a blender. Blend for 30 seconds on high or until the ingredients become fully combined with a creamy texture. Blend the soup for an additional 4 minutes until steaming hot, OR transfer mixture to a medium saucepan and bring to a simmer. Serve hot, with freshly-ground black pepper, if desired. 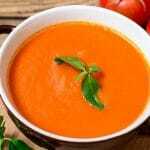 Here’s this Dairy-Free Cream of Tomato Soup recipe for today. 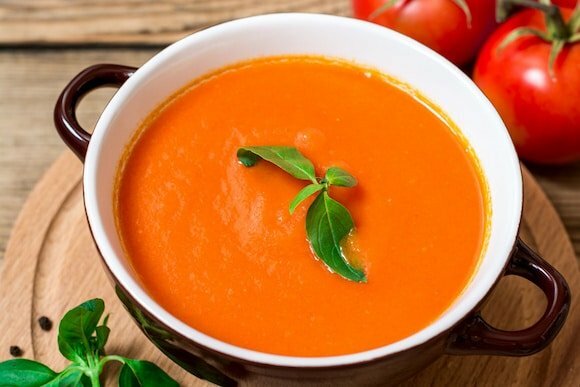 An easy blender Dairy-Free Cream of Tomato soup that can be made in minutes. 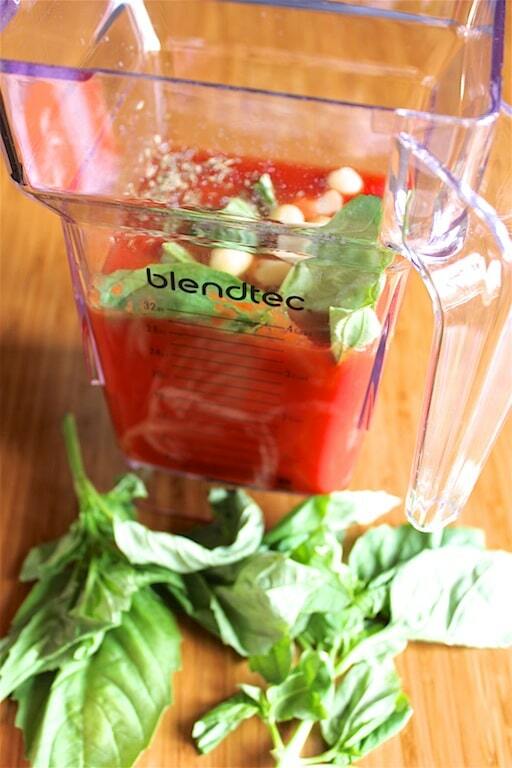 Combine the tomatoes, nuts OR avocado, herbs, and water in the pitcher of a blender. *If you do not have a high-speed blender such as a Blendtec, I recommend using the avocado instead of the nuts to ensure you have a creamy texture to your soup. Collagen protein for extra nutrition. I like Vital Proteins products. 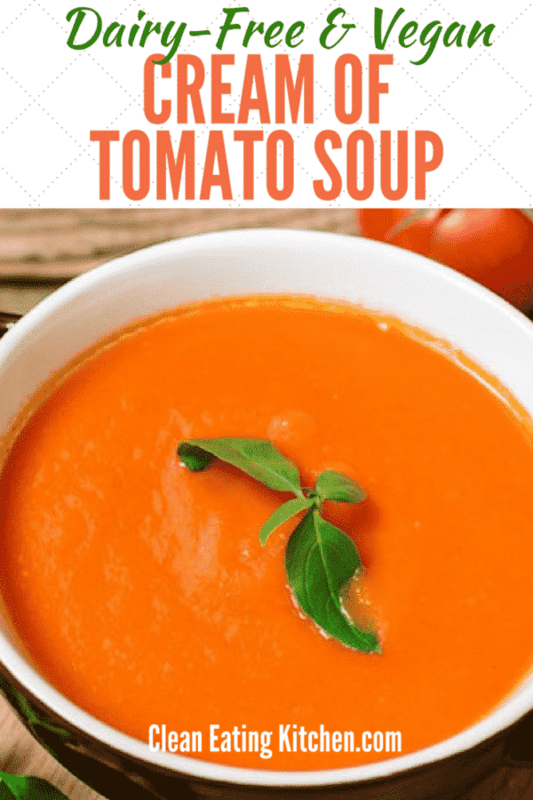 Here’s a how-to video for how to make this dairy-free tomato soup recipe (click through if you don’t see it below)! READ NEXT: WOULD YOU BENEFIT FROM GOING DAIRY-FREE? oin my weekly newsletter list to get all the latest news and recipe links delivered directly to your inbox. Looks yummy, Carrie! Happy Thanksgiving! Carrie; All I can say is yum and that looks like my type of recipe. I definitely will be trying it next week. Id love to know how it turns out for you, Judy! Happy holidays to you. Xo! Mmmm this soup sounds much better than the one with heavy cream. Tomato soup will forever be my favorite! Thanks for this recipe. Genius! This will be on our table this week. Thanks once again for a wonderful recipe. Oh, that looks mega good, and oh so easy. I bet it would work just as well with ripe tomatoes from the farmer’s market too, if they had tender skins, like Early Girls. I can almost smell that basil right now! Thanks, Kathryn! I so agree, I think making this recipe with fresh tomatoes would be amazing! XOXO. I am obsessed with tomatoes! This looks so good! That color! 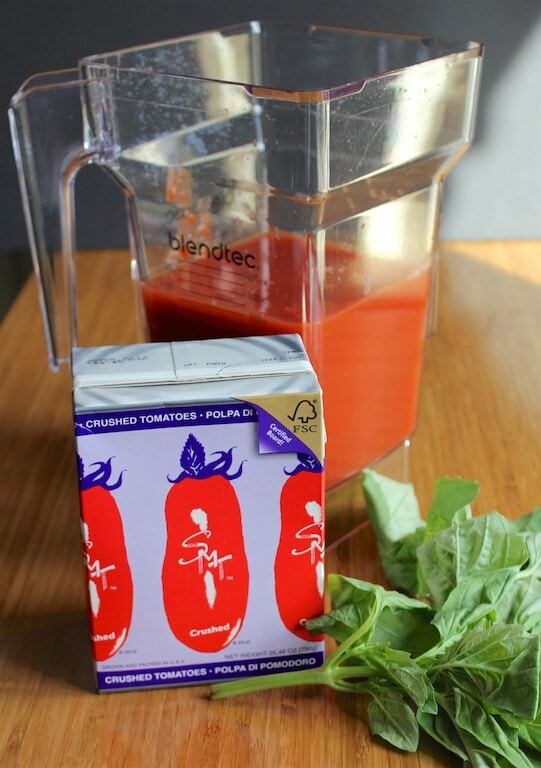 So my 5 year old has been asking for my tomato soup lately and I just don’t have the time to cook it – this is so fast! I am going to surprise her tomorrow! Ohhhh, let me know how she likes this soup, Renee! XOXO. I don’t think I’ve ever made soup from boxed tomatoes but it’s such a good idea! I’ll have to try this as I have a few boxes in my pantry! 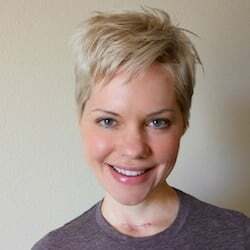 I would love to hear more about your experiences with your functional medicine physician. Will do, Paula! I recently did some food sensitivity testing that revealed some REALLY interesting data for me and has made a huge difference in my inflammation levels. Turns out, my immune system is reacting to foods I never would have thought, such as the garlic I mentioned. Cream of Tomato Soup was totally my childhood comfort food – this recipe looks gorgeous! This is the ultimate soup recipe! I love that it comes together so quickly in the blender, just a few minutes and you’re sitting down to a childhood classic! Awwww, thanks Kari!!! Beautifully said. 🙂 XOXO. Cashews is such a great alternative to dairy for that creamy texture. So sorry about not being able to enjoy garlic. Still can’t get over how beautiful this is and how yummy it sounds! Ohhhhh, thank you Allison!!! XOXO. Creamy tomato soup is such a comfort food to me. Can’t wait to try this! This sounds delicious! Such a great idea to use the cashews or macadamias to add that creaminess to the soup. Yum! I love tomato soup. It packs with so much umami deliciousness. This soup is so nutritional and the color is simply gorgeous. Love it ! My kind of summer soup! Refreshing and nutritious! Those boxed tomatoes always call my attention at the store. If I could eat them, I would be ALL OVER this! I understand, Cristina! I’m currently dealing with a bunch of food sensitivities (OMG, cauliflower, nooooo! ), but thankfully tomatoes seem to work okay for me. Thanks for the comment! XO. I love the short, simple ingredient list! This soup looks so creamy and delicious! This looks so easy and delicious! Can’t wait to try it! Thanks, Katja! LMK how it turns out for you! This soup looks so creamy and yummy, & it is dairy free! Good to have on hand when I occasionally go dairy free. Great recipe! So clear and easy to follow, will definitely give this a go, looks delish! Oh this sounds so good! I am going to have to wait for fresh basil from the market though – dried just wouldn’t the same. I have a feeling I’ll be seeing it soon anyway. Yes! I would love to hear more about it. It was recommended to Terry to cut garlic from his diet, he had to do it for much longer though – a year. Onion was on the list too. We tried reintroducing onion and it didn’t go well. But fear not – garlic went back in ok. I’m sure it will for you too! Awwww, thanks for such a sweet comment, Georgina! Have a great week!!! XOXO. Tomato sauce was always my favourite soup, great addition of macadamia or cashew nuts I bet they add a lovely creamy texture. This looks so good! I just borrowed my sister-in-law’s Vitamix, so now I have to try this. Had no idea until the other day that you could cook soup in a blender!! Cool, Becky! I hope you loved the soup. I bet you could make some amazing creations with the blender, you’re so talented!!! XO. Looks great! How did you get the protein content so high ? Was it just from the cashews? Oh yeah you do! 🙂 I like Blendtec or Vitamix blenders. There are some great roadshows for these products at Costco often. That way, you can see them in action. I was really hoping your video would show using Cashews – Will this (including cashews) taste like Heinz cream of tomato soup? That is the one thing I miss since coming to the light side 🙂 But – Obviously i am happier on this side than that side – But would like to make a soup tat reminds me of that soup….. I have a ninja blender so hopefully that will be ok….